The country they live in begins at the mountains and extends as far as the plains and the sea, thus having increased in length more than breadth; it is good for every use to which it may be put, though better for fruits than for grain. (..) Its cities are, first Ancona, a Greek city, founded by the Syracusans who fled from the tyranny of Dionysius; it is situated on a promontory, which by its curve towards the north encloses a harbour; and it is exceedingly productive of wine and wheat. The towns on the coast of the Adriatic are by far inferior in attraction to those in the western part of the peninsula (Tuscany and Umbria). (..) But the farther the traveller diverges from the beaten track, the more he will learn of the characteristics of this delightful country. K. Baedeker - Central Italy Handbook - 1883. In the past this part of Italy was not regarded as being very interesting by foreign travellers. 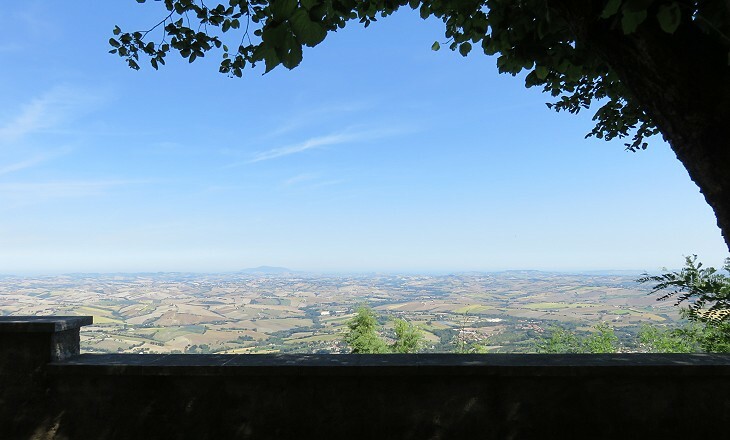 In recent years, because of its many hill towns, the monuments of Ancona and Loreto and its wines and cooking it has become a new and much less expensive "Chiantishire" for foreigners and Italians wishing to spend their holidays in the countryside. 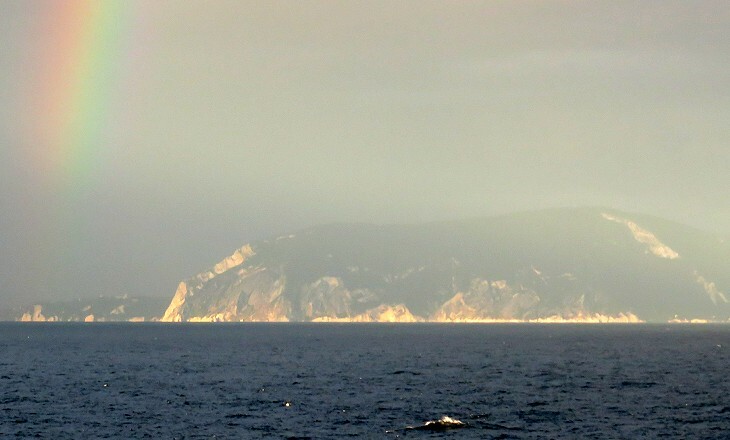 The way to Ancona is barred by Monte Conero, the seaward cliffs of which descend sheer into the water. (..) The isolated position of Monte Conero, and its sudden rise from out of a soil formed of horizontal strata, and of an entirely different system, has rendered it an object of much interest to geologists. (..) The height of Monte Conero is only 1877 feet above the level of the sea; but it completely shuts out Ancona and all the coast to the northward from the landscape as seen from the walls of Osimo or its neighbour towns. This chalk formation gives an appearance to the scenery of the road to Ancona, as it winds up and down the minor hills around the base of Monte Conero very English in character. There are parts of the South Downs of which it strongly reminded me. 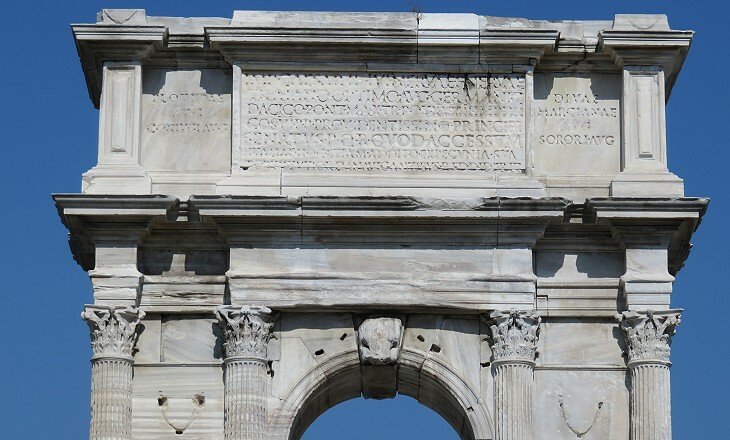 The inscription states that the arch was raised bv the Senate and People of Rome to Trajan Emperor and Caesar, son of Nerva, the conqueror of the Germans and Dacians, high pontiff, tribune and consul and a most provident prince for having at his own expense constructed the breakwater and thus rendered the access to Italy (Accessum Italiae) on this side safer to navigators. In June 105 Trajan sailed from Ancona to reach the Roman legions involved in the second Dacian War. Because of its location it was the Italian harbour nearest to the coast of Dalmatia, on the other side of the Adriatic Sea. During the good season ancient ships were able to cross the sea, instead of following the long route along the coast. Strabo mentioned several towns (Auximum, Septempeda, Pollentia, Potentia) in addition to Ancona in his description of the region. Auximum was situated on high ground and it still exists (Osimo). The other ones were situated in the valleys and they were abandoned after the fall of the Roman Empire as their inhabitants moved to more defensible locations. As the valleys became marshy and unhealthy all the population concentrated in the hill towns. The lack of a strong central power led their inhabitants to defend themselves by building walls, towers and castles. There is rarely a hill of some size without a small fortified settlement on its top. Although formally a possession of the Popes, Ancona became one of the most prosperous Italian maritime republics from the XIth to the XVth century. Its merchants developed strong links with those of the Republic of Ragusa on the other side of the Adriatic Sea and the ships of the two towns provided an alternative route to the Levant, breaking the Venetian monopoly. 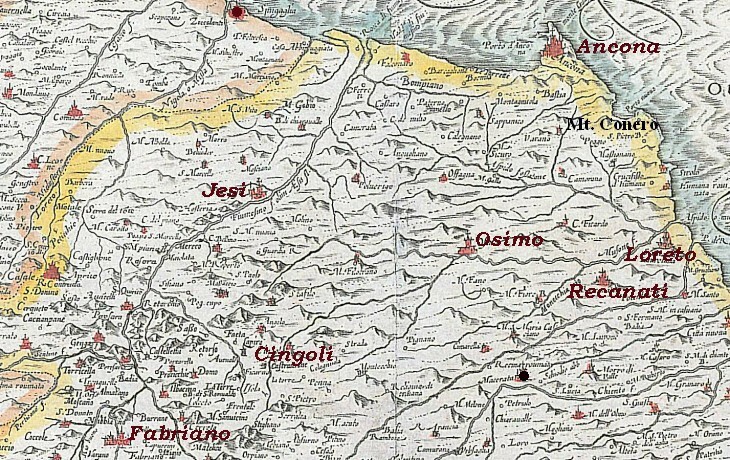 Ancona lost its independence in 1532 and after that it was ruled by a Papal Legate whose jurisdiction was eventually enlarged to include a territory (Marca d'Ancona) spreading from the Apennine Mountains to the Adriatic Sea. It bordered on the Duchy of Urbino which retained its independence until 1631. Today the Marches region is divided into 13 dioceses, but until the end of the XVIIIth century the dioceses neared 30. All the towns covered in this section have a Cathedral and a large number of churches, chapels and diocese related institutions, such as seminaries and charities. The Franciscans, the Dominicans and other religious orders built large convents in all of them. According to tradition in 1291 angels carried the house of the Virgin Mary from Nazareth to a location on the Adriatic shore opposite Ancona and three years later to a hill near Recanati. It was not until 1468 that the small building was surrounded by a large basilica, which to some extent had the features of a fortress, because of fears of an Ottoman invasion. Basilica della Santa Casa is the main Renaissance monument of the region owing to the marble screen encasing the House of Mary, the frescoes by Melozzo da Forlì and Luca Signorelli and the bronze doors. Similar to many other parts of Italy the Marches are subject to earthquakes with active faults under Mount Conero and under the Apennine divide between Fabriano and Gubbio. 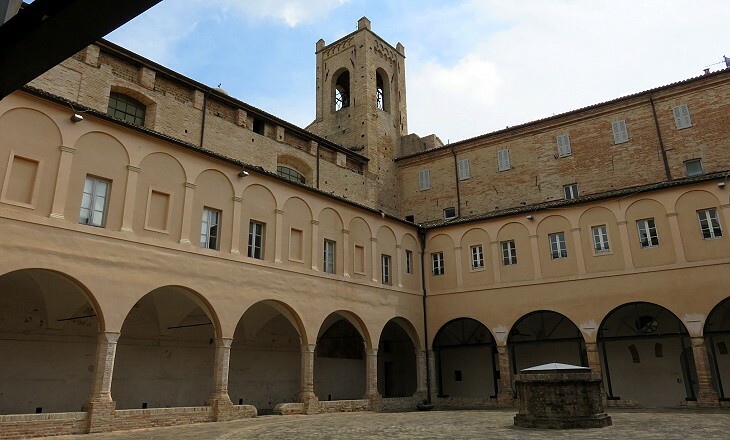 Ancona was struck by major earthquakes in 1690 and in 1972 and Fabriano in 1279, in the XVIIIth century and in 1997. 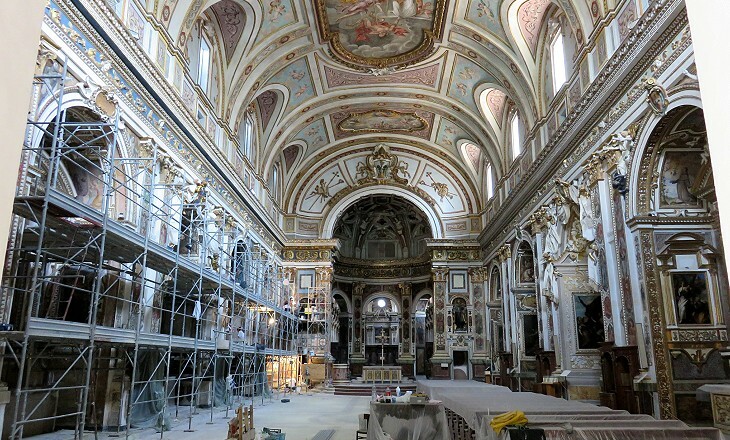 In general long and expensive restorations have been carried out to minimize the damage caused by the earthquakes. In addition to the impact of earthquakes, many towns of this region were affected by WWII bombing. 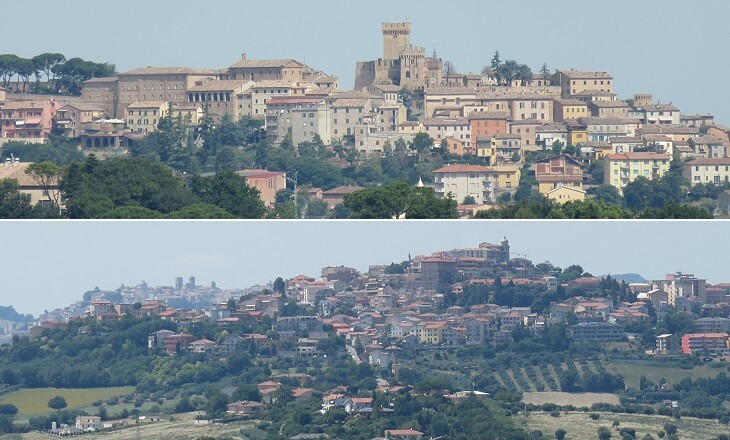 Ancona in particular had approximately 67% of its buildings destroyed. Dove era e come era (Where it was and as it was) is a motto coined in 1902 after the collapse of the bell tower of Venice. It was applied at Ancona and elsewhere in Italy for the post-war reconstruction of the monuments of the country. 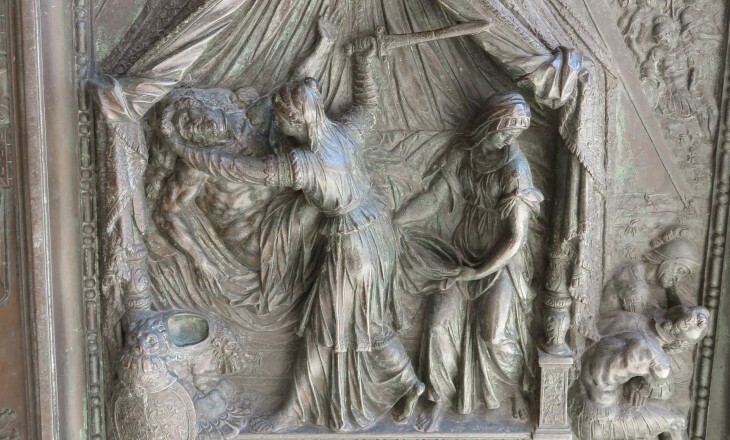 The image used as background for this page shows a statue by Giorgio Orsini (aka Giorgio da Sebenico) portraying a knight, the symbol of Ancona, at Loggia dei Mercanti. 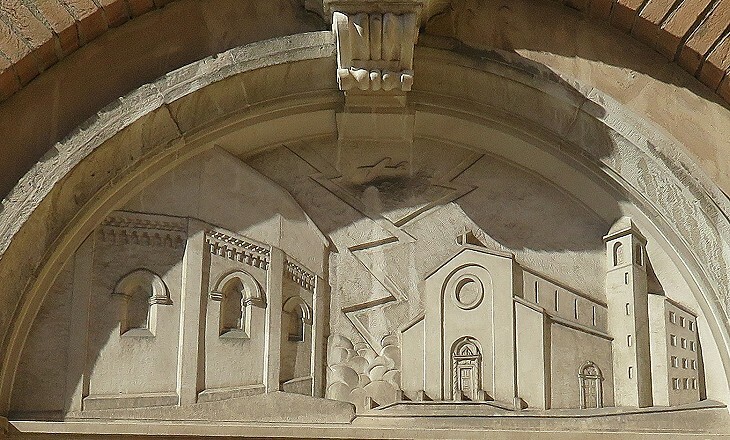 He is best known for his involvement in the design of the Cathedral of Sebenico in Dalmatia, but his last works are at Ancona.